New Kids on the Block was my first album I ever bought. I was embarrassed by that and didn't dare tell my friends. I was young and felt guilty that I never had a personal connection to music like my older friends. I remember growing up thinking punk rock looked spooky, but in 1990-91 freshman year of high school, that all changed. My first concert ever was Fugazi and from there on I was different. I was better. I felt better. I just ordered this DVD. Brings back so many good times and great memories. This band holds dear to me still to this day. Great movie, I always wanted to own a copy. My wife purchased it for me for my 35th birthday a few months ago. My 12 year old son watched it and he is now a Fugazi fan. I loved the way he articulated how much he liked both Ian and Guy's vocal styles, but for different reasons that provided both contrast and complement(he's a chip off the ol block to be sure.) Never in a million years did I think I would be hearing my little boy walking around the house singing "Never mind what's been selling, it's what you're buying". It was very inspirational to him, so much that he wrote a whole bunch of guitar parts throughout the summer and we started jamming(with me on drums) and have some pretty decent demo songs...I think we have the nucleus of a family band, and I have this video and Fugazi to thank for being the catalyst. Great music is timeless, thank you for existing Fugazi! I remember getting the video as soon as it dropped at my local music shop, JJ Records in Leuven. And having watched it, I remember feeling that buzz afterwards, the sense of perfection and completeness that the footage sparked. I have enjoyed the film numerous times since and still think it is the most amazing and spot on documentary possible. It is all I could have ever hoped for, and more. It is Fugazi. Just got this in the mail today. Man do I love some Fugazi !! I saw them in 1991 in Orlando,Fl and what a great show. This dvd is awesome. 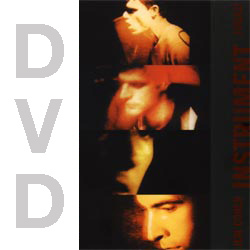 A must have for a fugazi fan.